On the extremely hot planet Sarr, the atmosphere is made up of gaseous sulfur with little liquid to drink. Natives of this planet, Sarrians, are intelligent aliens with tentacles. Sallman Ken is a police officer on Sarr. In order to find out about a deadly drug that comes from another planet, Ken is sent by his chief officer to go undercover on a drug dealer’s spaceship as a chemist. Ken is horrified by the frozen, sinister planet which he sees when they arrive in the solar system, and the bleak, red sun that is far away from it. They call this planet “Planet Three”, the place where they receive the dangerous narcotic. Ken is shocked when he finds out that Planet Three’s atmosphere is made of oxygen and nitrogen, and sulfur actually exists as a solid. Laj Drai sends torpedos down to the strange planet for the purpose of trading. The Sarrians use a box in the torpedo to trade with the natives of the planet, gold and platinum for tobacco. Meanwhile, the aliens are stationed on Planet One, and Ken is trying to find soil that matches Planet Three’s soil so that they could grow their own tobacco. Although the frozen planet is undesirably cold for Sarrians, he still develops interest and almost wants to visit it. He doesn’t stay curious for long, for Ken is sent onto the surface of Planet Three so he could collect soil. However, being an undercover agent, he also needs to find out the source of the deadly drug. I would describe Iceworld as a very hard yet rewarding science fiction book. The author writes this book in an extremely interesting way. As the reader starts the book, they would expect that Sallman Ken was a human, and the setting was Earth. 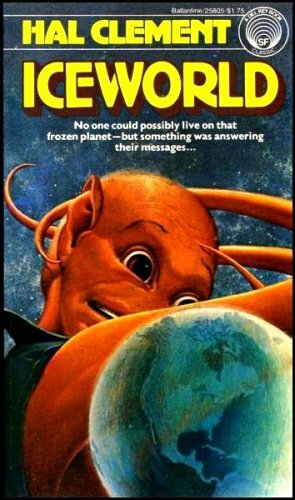 On the contrary, it is actually an alien planet, and Ken is an alien with tentacles. The whole story is based on the aliens’ point of view. Planet Three, the “frozen” planet, is actually Earth, and the creatures that live on it are humans. The main character, Sallman Ken, at first was apprehensive of the strange planet, but after his visit to it, he develops a small portion of affection to the humans living there. The content is laborious to read, but it creates the realism that I appreciated very much. The only flaw in this magnificent story is the behavior of the Sarrians. They act almost exactly like humans. Aside from that, this is a great story. Ken rescuing the human children was the best part for me because it shows his compassion. I would recommend book is suited to ages 13 and higher, and I rate it nine out of ten stars. 1. What is the name of the spaceship that Ken travels on? 1a. The spaceship that Ken travels on is named “the Karella”. 2. Why is Ken going to the frozen planet? 2a. He is on an undercover assignment to find the source of an addicting drug. 3. What planet is Ken from? 3a. Ken is a Sarrian, an alien who lives on the planet Sarr. 4. What is Ken’s job? His undercover job? 4a. He is a policeman, but he pretends to be a chemist. 5. Who is Laj Drai? 5a. Laj Drai is the drug dealer that trades with the natives of Planet Three, a.k.a. humans. 6. What is the deadly drug that the aliens trade for? 7. What items do the aliens give in exchange for the drug? 7a. They give them platinum and gold. 8a. They go to Planet Four in search of good soil for growing tobacco. 9. What does Laj Drai do when he discovers that Ken is a spy? 9a. Drai locks Ken up in a room with the drug and punishes him by forcing him to become addicted to the tobacco. 10. What does Ken do first when he arrives on Planet Three? 10a. He scoops up soil samples from the ground. 11. What happens around Ken while he is physically on Earth? 11a. Everything he touches burns. 12. Where does Roger Wing think the aliens have travelled from? 12a. Roger Wing thinks they have come from Mercury. 13. What does Roger try to teach to Ken? 13a. He tries to teach Ken english. 14. Why does Laj Drai propose violence with the humans? 14a. He realizes that the humans are weaker than he thought. 15. How does Ken punish Drai after he captures him? 15a. Ken leaves him stranded on Mercury until Sarrian police forces come in.